The Text of the Gospels: Luke 24:13: Do You Know the Way to Emmaus? Luke 24:13: Do You Know the Way to Emmaus? How far was the village of Emmaus from the city of Jerusalem? Sixty stadia (the equivalent of approximately 6.9 modern miles, reckoning one Roman stadium as 607 feet) or 160 stadia (the equivalent of approximately 18.4 modern miles)? 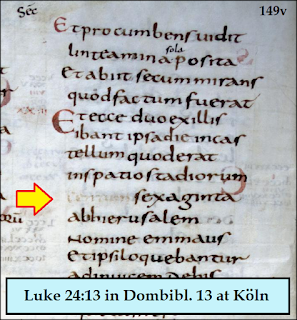 Almost all existing Greek manuscripts of the Gospel of Luke, including Papyrus 75 and Codex Vaticanus, state in 24:13 that the distance was 60 stadia. In Codex Sinaiticus, however, and some other manuscripts (including Codex Cyprius (017)), and in Armenian manuscripts and in the Palestinian Syriac version, the distance is said to be 160 stadia. 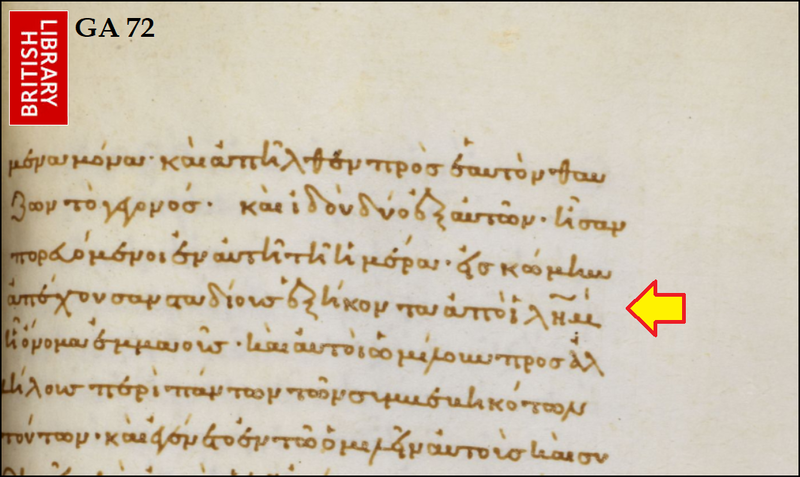 The second edition of the UBS GNT had a little more data: Codex Π (041) and minuscule 1079* are listed as witnesses for ἑκατὸν ἑξήκοντα, and a corrector of 1079 is listed as a witness for ἑξήκοντα. 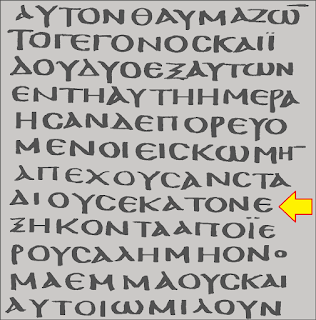 Codex Cyprius (K) - ἑκατὸν has been erased. Swanson confirms that Codex Π supports ἑκατὸν ἑξήκοντα. 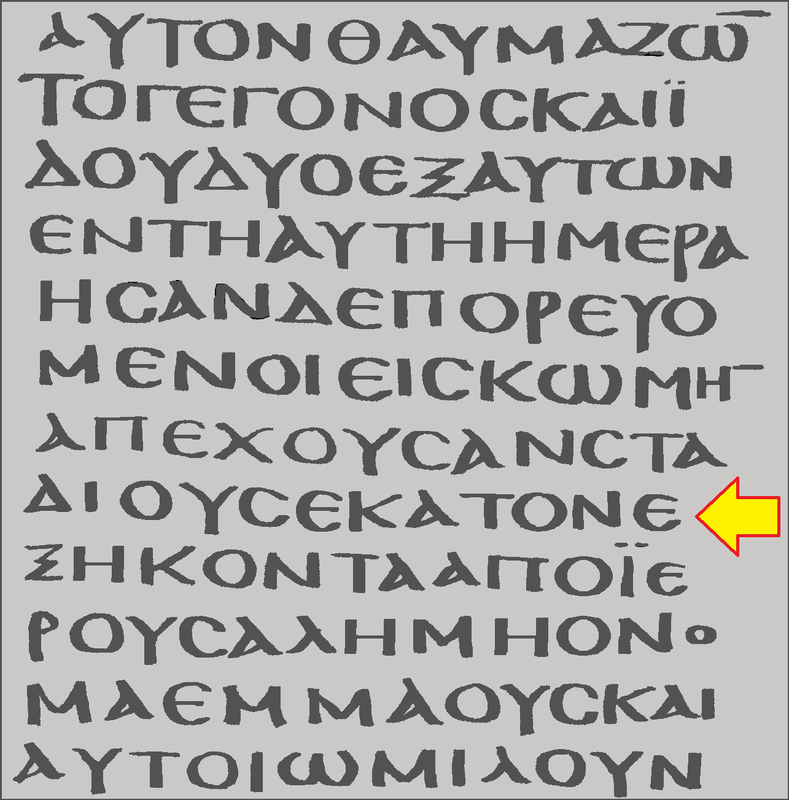 Codex K (Cyprius, 017) supports ἑκατὸν ἑξήκοντα, but someone has attempted to erase the word ἑκατὸν. 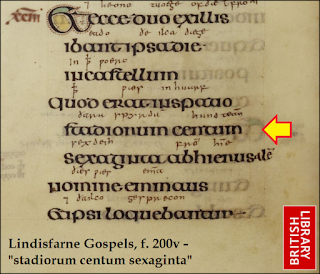 And in Codex N (022, one of the Purple Uncials, from the mid-500s), the word ἑκατὸν was written by the copyist, but its letters were crossed out and marked for deletion by a corrector. 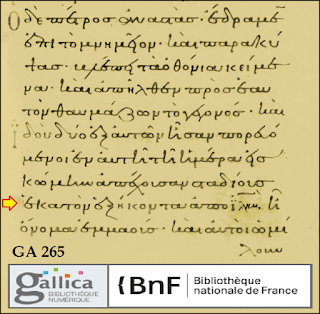 (The apparatus should therefore list N for ἑκατὸν ἑξήκοντα and N2 (a corrector of the manuscript) for ἑξήκοντα.) The little-known uncial 0211 is listed by Hikmat Kashouh in The Arabic Versions of the Gospels (Appendix, p. 495) as support for ἑκατὸν ἑξήκοντα, and so are minuscule 1604 and two important copies of the Harklean Syriac (Vat. Syr. 267 and Vat. Syr. 268). Kashouh (if I understand his references correctly) also notes that Family B of the Arabic Gospels supports ἑκατὸν ἑξήκοντα. The three Arabic manuscripts that constitute Family B are all part of the New Finds collection at St. Catherine’s Monastery: Ar. N.F. Parch 8,28; Ar. N.F. Parch 24; Ar. N.F. Parch 44. Ar. N. F. Parch 8,28 (two parts of what was once one codex) has been assigned to the 700s-800s. Minuscule 114 - ἑκατὸν has been erased. Also, although 079 is assigned a “vid” qualification in the UBS4 apparatus (meaning that the editors are unsure whether it really has this reading), in Tischendorf’s transcript of the manuscript there seems to be no expression of doubt about it, and even if the script were unclear, space-considerations seem to require it. And, in the apparatus on page 464 of Horner’s The Coptic Version of the New Testament in the Southern Dialect (Otherwise Called the Sahidic and Thebaic), Volume II: The Gospel of Luke (1911), in addition to the uncials already mentioned, the author lists the Greek minuscules 158 175mg 223* 237* and 420* as support for ἑκατὸν ἑξήκοντα. He also mentions that an Armenian copy refers to 150 stadia rather than 60 or 160. 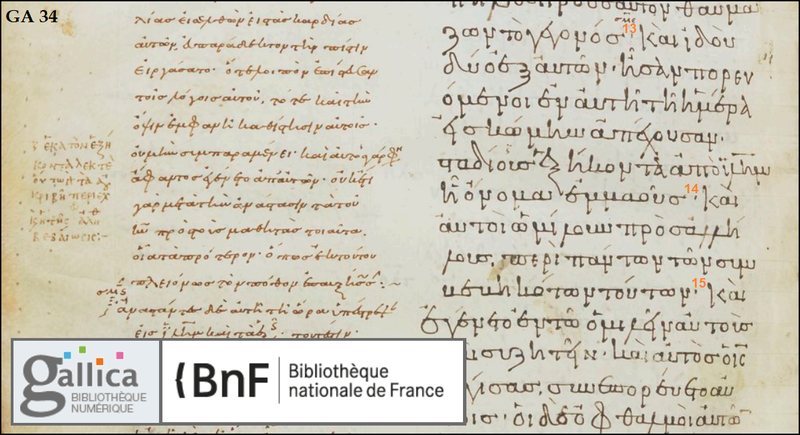 Among the hundreds of Greek manuscripts that support ἑξήκοντα are Codex M, Codex S (in which a note in the margin says “milia h,” that is, eight miles. ), Codex X, Codex Y, 5, 11, 22, 45, 72, 116, 137, 162, 178, 389, 645, 714, 716, 817, 1152, 1186, 1187, 1200, 1216, 1263, 1318, 1358, 1364, 1691, 1780, 2099, 2121, 2123, 2304, 2322, 2612 (on page-view 473), 2615 (on page-view 373), 2757 (on page-view 413), 2812, and Lectionary 37 and Lectionary 150 and Lectionary 300 (all confirmed by consultation of digital page-views). Although minuscules 114 and 265 are not listed in the UBS apparatus, they both support ἑκατὸν ἑξήκοντα, and so does 1219*. The Nestle-Aland (27th edition) apparatus also lists Lectionary 844 and Lectionary 2211 in favor of ἑκατὸν ἑξήκοντα. Papyrus 75’s testimony is unusual: instead of writing ἑξήκοντα out in full, its scribe used the Greek numeral Ξ, overlined, to represent sixty. The Palestinian Aramaic (represented by “Syrpal” in the apparatus) is constituted by the three manuscripts consulted by Agnes Smith Lewis and Margaret Dunlop Gibson in their 1899 transcription; they note that in Luke 24:13, “All add ἑκατὸν καὶ before ἑξήκοντα.” Colophons in these three manuscripts establish their production-dates in 1030 (for Aramaic MS A, at the Vatican Library), in 1104 (for Aramaic MS B), and in 1118 (for Aramaic MS C). 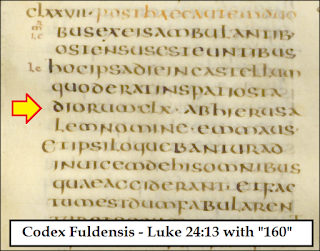 The Gothic manuscript Codex Argenteus is not extant in the Gospel of Luke beyond 20:46. 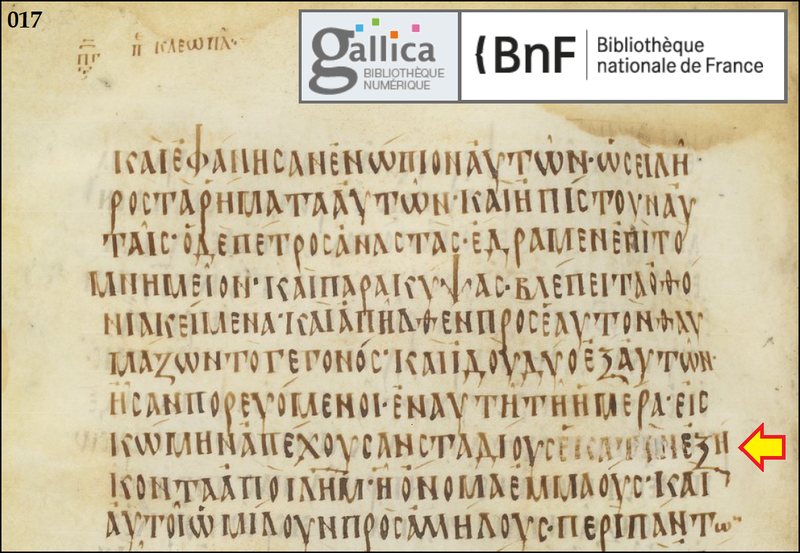 However, the small Latin-Gothic fragment known as Codex Gissensis (destroyed in 1945, but photographed) may provide the grounds for a calculated guess that the Gothic version supports the reading ἑξήκοντα. A reconstruction of the Gothic text of Codex Gissensis by Magnus Snaedel indicates that the line on which the number of stadia was written did not have room for the reading “one hundred and sixty stadia,” if the sum was written in full rather than represented with numerals. Minuscule 72, supporting the majority reading. This interesting textual contest is not mentioned in footnotes in the ESV, CSB, NASB, NIV, NKJV, NLT, or even the NET. It was, however, mentioned in a footnote in the NRSV. In 1881, this was one of the readings selected for special attention in Hort’s Notes on Select Readings. All major English versions reflect the reading ἑξήκοντα. Let’s take a few minutes to explore the context of this variant-unit. In Luke 24, the two travelers, after meeting their resurrected Lord on the road to Emmaus, make the journey back to Jerusalem to share the good news about the resurrection of Jesus with their fellow disciples. If the distance was seven miles, the travelers could reach Jerusalem in an hour and 10 minutes, running at six miles per hour. At a slower rate – four miles an hour – they would still reach Jerusalem in an hour and 45 minutes. However, if both travelers were reasonably healthy, and they started the 18.4 mile trip back to Jerusalem at 6:00 – for before their meal began, one of them observed that “It is nearly evening and the day is far spent" (Luke 24:29b, MEV) – then at a steady pace of four and a half miles per hour, they would reach Jerusalem slightly after 10:00 p.m. At a steady pace of four miles an hour, they would arrive in Jerusalem at about 10:40 p.m. Such a feat might have been challenging, but it would be by no means incredible or miraculous or absurd. As we look further into this contest, it might be helpful to have some background information about the city of Nicopolis, which is presently known as Amwas, about 18 miles west-by-northwest of Jerusalem (not to be confused with the Nicopolis in northwestern Greece, mentioned by Paul in Titus 3:12). This was the site of an important battle that took place in the Maccabean revolt, and is mentioned in the apocryphal book of First Maccabees (3:40). In 4 B.C., after the Roman army had to stop some violent riots following the death of Herod the Great, the Roman general Quintilius Varus burnt Nicopolis. (This was, by the way, the same Quintilius Varus who led three Roman legions to a catastrophic defeat in the Battle of the Teutoburg Forest in A.D. 9.) Over two centuries later, during the reign of the Roman Emperor Elagabalus (r. 218-222, followed by Severus Alexander (r. 222-235)), the emperor granted a request to rebuild the city. The group of citizens making this request was led by a resident of Nicopolis named Julius Africanus. Julius Africanus was a Christian author, and his activities were later summarized by Jerome in Lives of Illustrious Men, chapter 63: “in the reign of Marcus Aurelius Antoninus, whose reign followed that of Macrinus, he received a commission to restore the city of Emmaus, which afterwards was called Nicopolis.” Julius Africanus’ work on the harmonization of the genealogies of Christ and his Chronography were thoroughly digested by later writers, and a fragment of his multi-volume Kestoi is preserved in a papyrus found at Oxyrhynchus, Egypt which must have been made very close to the composition-date of that work. At some point, probably in the 230s, Julius Africanus corresponded with the controversial theologian Origen; earlier in the 200s they had both studied in Alexandria, Egypt; later Origen’s headquarters in Caesarea were not far from Nicopolis. About a century later, the scholar Jerome mentioned Emmaus, in Epistle 108, To Eustochium, as he described the sites visited by Paula during her pilgrimage in the Holy Land: after visiting Joppa, “Again resuming her journey, she came to Nicopolis, once called Emmaus, where the Lord became known in the breaking of bread, an action by which He dedicated the house of Cleopas as a church.” Jerome had read Eusebius’ Onomasticon, and had translated it into Latin, so it is not surprising that he, too, identified Nicopolis as Emmaus. ● The Echternach Gospels (800s). 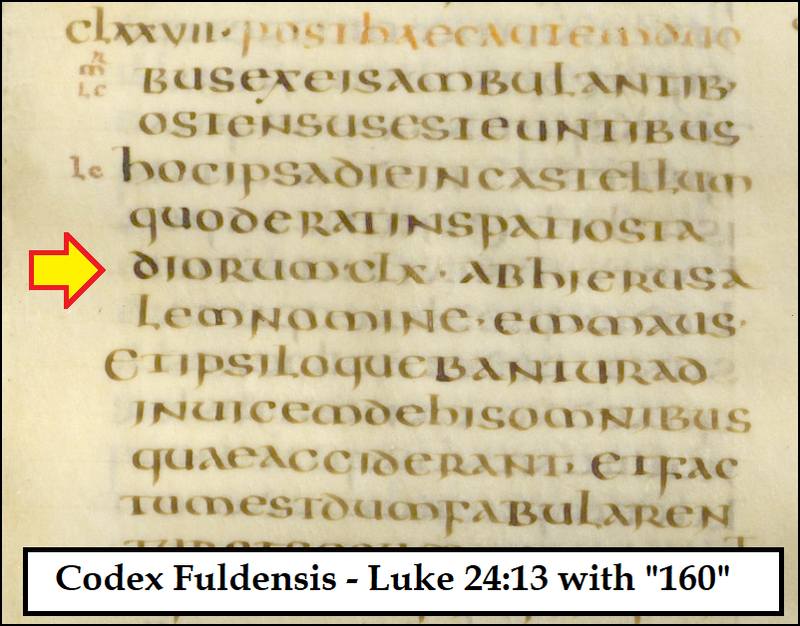 Considering that no Old Latin manuscripts support “160,” it is rather tempting to conclude that the Vulgate initially read “160” in Luke 24:13. 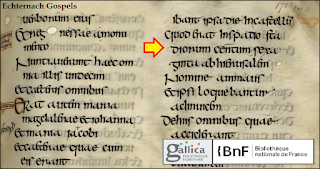 The Book of Birr, however, supports “sixty,” written as LX. The Wigbald Gospels (Barb. 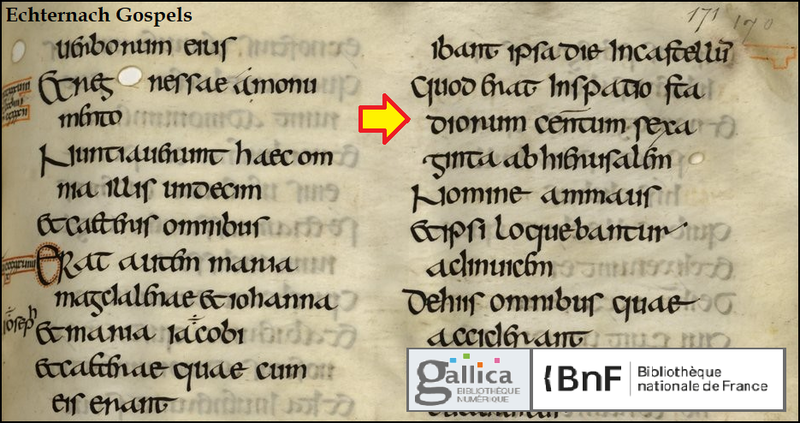 Lat 570 at the Vatican Library) supports “sixty.” VL 12, also known as Codex Claromontanus (the other Claromontanus, that is, Vat. Lat. 7223) reads sexaginta. So do Vat. Lat 43, Regin. Lat. 4 at the Vatican Library, Pal. Lat. 47 at the Vatican Library (as “LX”), Lat. 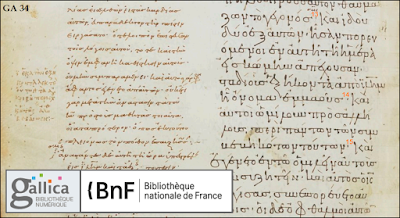 262 at the National Library of France (as “LX”), Harley MS 1775 at the British Library (as “‧LX‧”), Codex Aureus (BSB Clm 14000), Cotton MS Tiberius A II at the British Library, MS 286 at Corpus Christi College, and Codex Guelf. 61 Weiss. However, Dombibl. 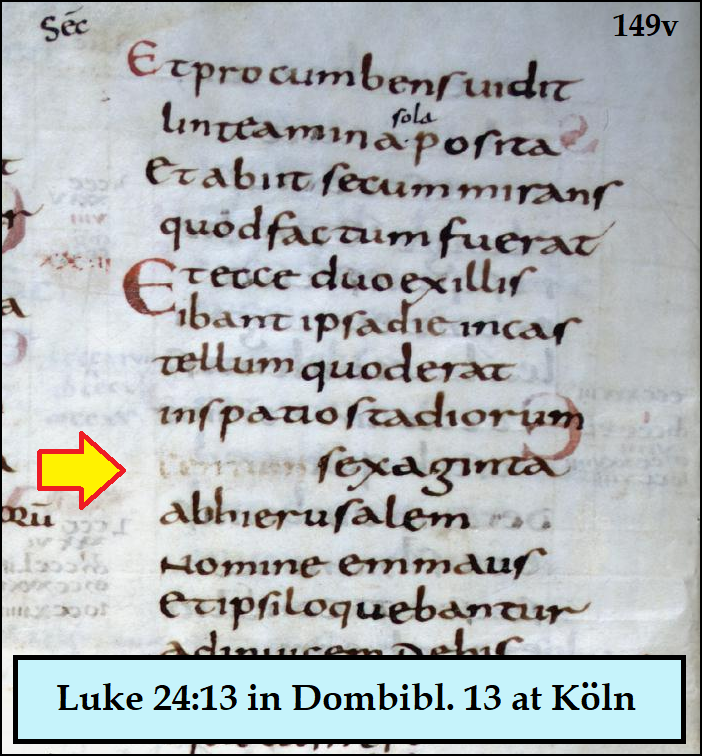 13 at Köln, Germany supports centum sexaginta, although the word centum has been partially erased. Eusebius and Jerome both accepted the idea that Emmaus and Nicopolis were the same place. Possibly they inherited that idea from an earlier writer, namely Origen, who assumed that the site of the Maccabean Battle of Emmaus was the same place mentioned in Luke 24:13. 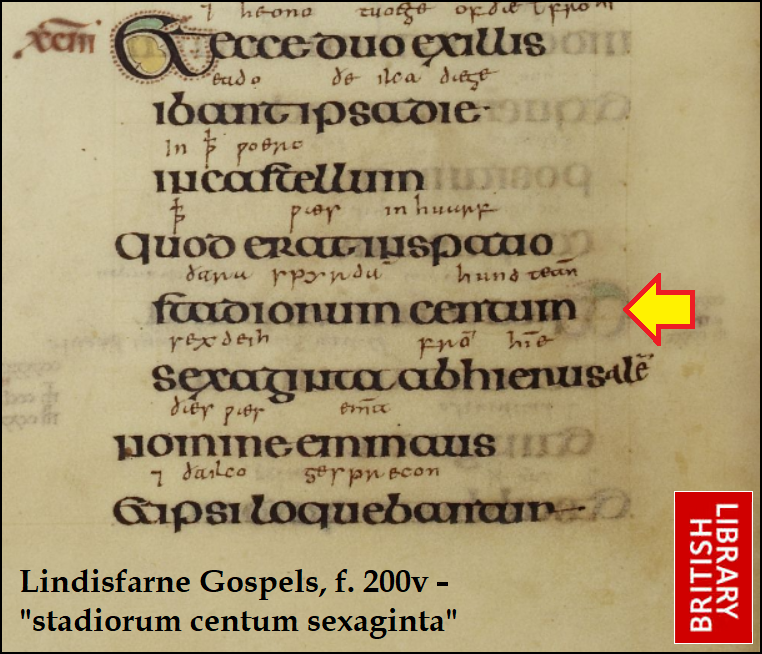 This is suggested by a note that appears in the margin of minuscule 34. 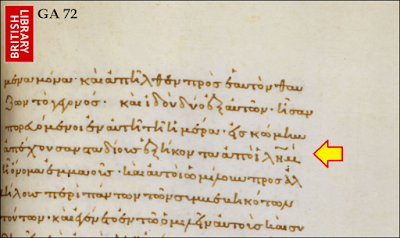 The note means, “One hundred and sixty: for this reading is in the accurate [copies] and Origen truly (figuring that “αληθ” is a contraction for αληθειας) confirms it” (or, “Origen confirms that it is true”). 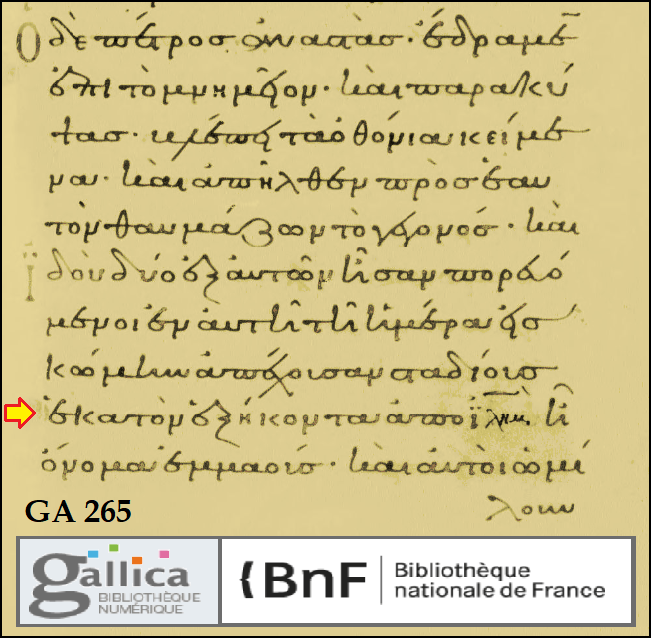 A similar note appears in minuscule 194 (on fol. 188v). Thus the evidence for the reading “160 stadia” not only goes back to Sinaiticus in the mid-300s, and to Eusebius in the early 300s, but – assuming that the author of the note in minuscules 34 and 194 was not confused about the source of the statement about the reading “160 stadia” – goes back to Origen in the first half of the 200s. It would not be difficult at all for an interpreter such as Origen, once he was convinced that Nicopolis and Emmaus were the same location, even if he possessed exemplars that read “sixty stadia,” to leap to the conclusion that an earlier copyist had accidentally skipped over the word ἑκατὸν, and thus created the reading “sixty stadia.” In Greek, such an error can be made due to homoioarcton (in this case, two words – ἑκατὸν ἑξήκοντα – begin with the same letter); in Latin it is possible due to homoioteleuton (in this case, two words – stadiorum centum – end with the same two letters). Some additional data comes to us from the writers Hesychius of Jerusalem, Cyril of Alexandria, Sozomen, Philip of Side, Theodosius the Archbishop, and Abba Gelasios; their testimony can be found at the meticulously researched website http://www.emmaus-nicopolis.org/English/thehistoryofemmaus/byzantineperiod . They all equate Nicopolis and Emmaus as one and the same place. Hesychius, in particular, seems to take for granted that it was a long way from Emmaus to Jerusalem, telling his readers that they should not be surprised that the two travelers managed to go from Jerusalem to Emmaus and then from Emmaus to Jerusalem, on the grounds that the statement that it was “toward evening” can mean (he says) that it was just one o’clock in the afternoon. Since Hesychius resided in Jerusalem it can probably be safely assumed that he regarded Nicopolis and Emmaus as the same place – and this is why he made this additional point. Cyril of Alexandria, in the course of commenting on Luke 24:33, apparently felt obligated to circumvent the natural flow of the text, positing a chronological gap between the first and second halves of the verse: “It was not at this hour that they found the eleven gathered, and that they gave them the news about the Lord Jesus, but this took place on the fortieth day after His resurrection, on which day He was taken up.” This creative interpretation removes the need for speed on the part of the two travelers in order for them to reach Jerusalem while the main group of disciples was still gathered together. Although the wording of this comment is similar to Cyril’s, the idea being proposed is entirely different. If the comment does not belong to Cyril then at least it demonstrates someone’s awareness of the “160 stadia” reading. This probably represents a copyist’s guess that Emmaus was located at what is identified more commonly as Bethel. In the Septuagint, Genesis 28:19 refers to “Oulammlous” instead of referring to Luz. It has been suggested that this location was brought to mind because of a sort of vague correspondence between the state of mind expressed by Jacob in chapter 28 of Genesis, and the experience of the two travelers who talked unknowingly with Jesus: “Surely the Lord is in this place, and I did not know it.” Geographically, Bethel/Luz is 12 miles north of Jerusalem, too far to be 60 stadia from Jerusalem and not far enough to be 160 stadia away – but a scribe who was unaware of the geography involved could guess, based on the similarity between Emmaus and Oulammaous and Eulammaus (the name in the Latin text of Luke 24:12 in Codex D), that they were the same place. 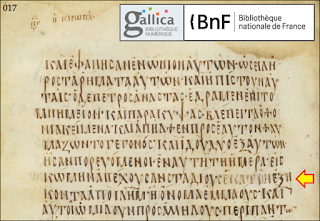 The reading ἑξήκοντα is supported by a wide array of witnesses in the early Alexandrian Text (such as P75, B, L, and 892), the Byzantine Text (Codex A and many others), the Western Text (D and the Old Latin), and the Caesarean Text (f1). 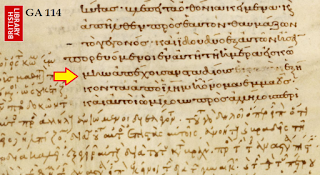 Yet the testimony for ἑκατὸν ἑξήκοντα also appears diverse at first glance: Sinaiticus’ text of Luke is essentially Alexandrian; N, K, and Π are mainly Byzantine; Θ and the earliest strata of the Armenian and Georgian versions are Caesarean. Here is how: The disciple named Cleopas (identified by Hegesippus as a brother of Joseph; Epiphanius says the same thing) had a house in Nicopolis, but Emmaus – perhaps the site known today as El-Qubeibeh or another site at Abu Ghosh – was only a stop on the way there. The two travelers’ plan had been to travel to Emmaus, seven miles from Jerusalem, and stay overnight before continuing on to Nicopolis the next day, before Jesus appeared to them. After the Bar Kokhba Revolt (132-136), a tradition survived to the effect that Cleopas had resided in Nicopolis. His house was still there. In the early 200s, Julius Africanus was among those who assumed that Cleopas’ house was one and the same as the place where Jesus blessed the bread with Cleopas and his fellow-traveler. This led to another assumption, specifically, that scribes had miscopied the number of stadia between Jerusalem and Emmaus in Luke 24:13, by skipping the first letter of ἑκατὸν and jumping to the first letter of ἑξήκοντα. It was not easy for Christians who were aware of the existence of Cleopas’ house in Nicopolis to defend the reading ἑξήκοντα, inasmuch as when one assumes that Emmaus and Nicopolis are the same place, ἑκατὸν ἑξήκοντα fits the geography much better. For this reason, we see support for ἑκατὸν ἑξήκοντα in compositions by persons who lived in or near Jerusalem and Nicopolis (and in compositions by other persons familiar with those earlier compositions) – writers who would have the opportunity to see Cleopas’ house in Nicopolis. Because they assumed that Nicopolis was Emmaus, it seemed to them that the distance recorded by Luke had to be 160 stadia. To sum up: in the witnesses for ἑκατὸν ἑξήκοντα, we see the influence of an awareness that Cleopas’ house was in Nicopolis. This awareness had elicited the assumption (promoted in the first half of the 200s by Julius Africanus, and by Origen, who also advocated readings in Matthew 8:28 (and parallels) and John 1:28 that cleared up puzzling geographic questions) that Emmaus and Nicopolis were the same place. Most copyists were content to mechanically copy their exemplars, but it would be difficult for copyists who had visited Jerusalem and Nicopolis, or who had read, from a respected author, that Nicopolis was Emmaus and that it was one hundred and sixty stadia away from Jerusalem, to produce manuscripts that said that Emmaus was only sixty stadia from Jerusalem. 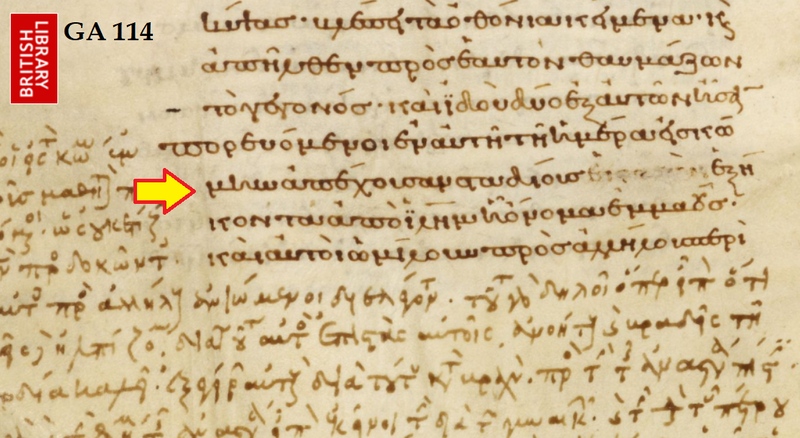 The scribes of Codex Sinaiticus, very probably working in Caesarea in the mid-300s, almost certainly knew Eusebius’ Onomasticon and its reference to Emmaus as Nicopolis. In light of the marginal note in minuscules 34 and 194, it seems likely that Eusebius perpetuated rather than originated a conjecture that ἑκατὸν ἑξήκοντα must be the true reading – after all, there were 160 stadia between Jerusalem and Cleopas’ house in Nicopolis, not just 60. The reading ἑκατὸν ἑξήκοντα should be considered a tremor of textual instability with Eusebius’ Onomasticon (echoing Origen’s reasonable but incorrect assumption) at its epicenter. Copyists who encountered Eusebius’ claim to the effect that Emmaus and Nicopolis were the same place – or the same claim in the writings of Jerome, Sozomen, et al – would likely be tempted to alter the text of Luke 24:13 so as to make it match up with what they thought was a geographical fact. Most copyists, however, if they ever felt such a temptation, successfully resisted it, content to simply reproduce the text of the exemplar that was given to them. The Modern English Version (MEV) is Copyright © 2014 by Military Bible Association. Used by permission. All rights reserved. As always, very well reasoned conclusion.